Every year, as January 1st arrives, we set self improvement goals to lose weight, to travel more, or to spend more time with family. 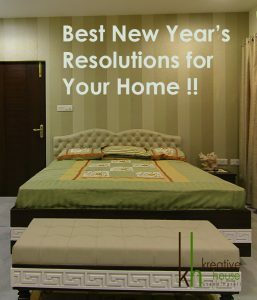 This year, why not set some New Year’s resolutions for your home as well? Take some time to consider what will make your home a more efficient, clean and appealing place to live. Here are few home improvement goals to focus on….. The year has finally arrived for you to declutter your house for good. We tend to attach ourselves to pointless objects we don’t need, therefore accumulating piles of clutter. Get rid of things you don’t need or haven’t used in a year. Donate items that are useful! You’ll find you have more space, and ultimately, you’ll feel good. Speaking of decor accents – it’s often the little things that make the biggest difference. One interior design New Year’s resolution can simply be budgeting for a fresh collection of decorative items. This is a budget savvy way to introduce new color, pattern, texture, and finish to a space. Get playful with geometric designs or typography on pillows or change up a lamp base with a new shape of shade. Such items are nice investments since they can be reused in varied spaces or with other combinations. The beginning of the New Year is the perfect time to replace batteries in your smoke detector and carbon monoxide detector. Make sure they’re working properly to keep your home and your family safe. Check fire extinguishers, chimneys, and flues to ensure they are working properly and are clean and safe for fire prevention. 5. Create a cleaning routine. Establish a weekly or monthly cleaning routine for your space this year, rather than letting the clutter pile up. With 2018 just underway, start constructing your list of home improvement New Year’s resolutions. This year, make your home a more beautiful, organized, efficient, and happier place to live!